Deep in the shadowy foothills of the Blue Ridge Mountains lies a dying town. Why is there a cemetery at the bottom of Bell Lake? Why am I drawn time and again to a hidden grave I've discovered in the woods? Something is eating away at the soul of this town, this withering kingdom, and it will only be restored if I can uncover the truth. I maybe enjoyed this second book of the Graveyard Queen series a bit differently than I enjoyed the first book. 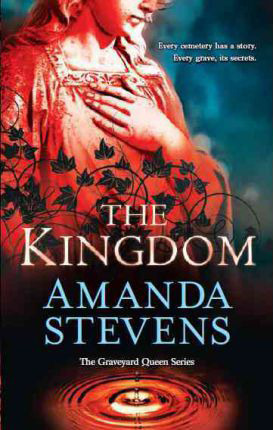 The Kingdom had all the intriguing elements of a ghostly, paranormal mystery; but at the same time, it kind of played off more in character development than it actually did in the mystery aspect. So, in a way, to me, this book felt more like a "bridging" novella (a long one at that) which will probably end up connecting The Restorer with The Prophet. Although, since I've yet to read The Prophet, maybe that assumption is too early to make. Overall, I enjoyed this book. It wasn't the horror-fest that many would probably be expecting, and in a way, there was a rather monotonous telling that got me a little sidetracked. But upon reading further, I wanted to continue reading more. The atmosphere is still as dark and creepy as ever and the writing is good. Amelia is still intriguing as a character, while at the same time, she still doesn't stand out much. Her development in this book draws my attention more than it did in the first book; however, I doubt I'll recall much about her after I've finished with this series. The rest of the characters strike me as the same way--interesting, but no one really stands out. On a side note, one way to really kill the mystery excitement for me is to constantly have characters recite that all too familiar: "We don't like to talk about that." Yeah... so what do you talk about? Because if the only thing keeping the mystery from being known is a simple conversation as a reveal-all device, it kind of annoys me. Anyway, nothing too overall exciting about this book, which was a bit of a disappointment since I'm enjoying it. We'll just have to see with the next book if there's going to be more excitement. For The Kingdom in general, I honestly already had the mystery figured out by the time I was a quarter of the way into it. Too many obvious clues were laid out that forced you to make those connections and so the the only thing you were anticipating was when Amelia would make those connections--another plot device I kind of get frustrated by is when the reader already knows what's going on and is forced to continue watching as the main character stumbles around in the dark until he or she figures out the mystery. This review was originally posted at Ani's Book Abyss / BookLikes in October 2013.